Pierre Richard, left, and Bryce Colenbrander of Happy Goat Coffee Company demonstrate the siphon brew technique. Photo by Aaron McKenzie Fraser. You want the very best in food, don’t you, not to mention excellent wines? So why not demand the same of your coffee? Up to you whether it’s mellow or smoky, round or wiry, chocolatey or nutty. And fresh? Go ask Pierre Richard at Happy Goat — that’s his bugbear. Stale, bland roast simply isn’t worth a plugged nickel, I’m afraid. Richard stamps the day of roasting on every bag of coffee he sells. He’ll even custom-roast small batches — in light, medium, or dark — of single origin or the blend of your choice. Richard operates Happy Goat out of a refurbished garage in Mechanicsville. The wooden kitchen table in this cozy space is where it all happens, with Richard as engaging host, customers coming and going and saying hello to one another. Hang around, and it’s possible that Michael Sunderland of michaelsdolce will bring by a jar of his peach and cardamom jam, along with bread from Art-is-in; someone else might unwrap their just-baked poppy-seed cake. Over there in the corner, meanwhile, the roaster keeps chugging away. As you may guess, Happy Goat feels just like home. Wouldn’t you know it, too, Richard has a favourite way of brewing his coffee. 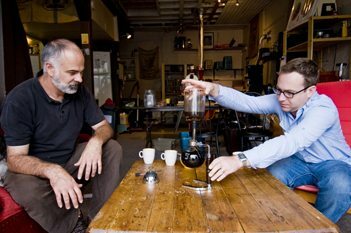 Invented in Berlin, the siphon method is over 170 years old. First time making siphon coffee, you may very well recall your teenage chemistry classes: two round glass vessels are used, one atop the other to resemble an hourglass, set on a flame reminiscent of a Bunsen burner. (The stovetop works just as well.) The system, taking hardly any time, involves vapour pressure, vacuums, bubbling, and some exquisite aromas. Ready for a smooth cup without any trace of bitterness? Saturdays, Richard clears the deck to demonstrate siphoning. Visitors come to Happy Goat from all over. Recently, Richard welcomed a party of six from New York, one of whom boasted of his city’s incredible java. Richard humbly brewed up a pot of Babae’s Espresso Blend. And at first sip, the fellow’s tune changed dramatically, his agitation yielding — momentarily at any rate — to the pleasure at hand. Here was the quintessence of coffee — full-bodied, satisfying. Everyone left happy, carrying off bags of freshly roasted coffee. “My dream is to have the most amazing coffee house in the world,” exclaims Richard. Included in this dream is a deep sense of conscience, of helping others. Hence his love of teaching. As well, Richard has designed an easily navigable website for those with disabilities. He also supports coffee distributors that trade fairly and, in time, plans to buy directly from the growers. Further down the line will come the development of a foundation allowing children from poor villages, say in Mbale, Uganda, a chance to attend school — a program that can pass on from generation to generation. At the moment, though, Richard is making exciting plans — none of which he will divulge. Keep all ears and eyes open. And wake up to a decent cup of coffee.